Finding the right useful typeface for projects can be pretty challenging. Fortunately, the Minima One Animated Font got you sorted. Its over-the-top animation is designed to add real impact to any visual projects. Ready to take your designs to the next level? Grab It Now! Minima One is a modern and minimalist sans-serif font that's pre-animated in Photoshop. It is a good blend of modern and urban design ideal for all kind of visual projects. This animated font is saved as .PSB file that is easy to drag and drop into the artboard. You can also move around the font like regular Smart Object files in order to create the video ads or social media content. Commercial License included in this deal. 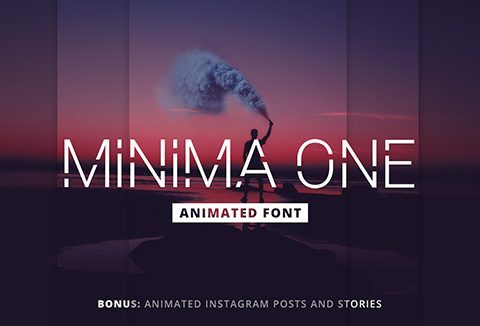 Spruce Up Your Next Project With Minima One Animated Font. Get This Deal For Just $26 $19. DealClub Members?? Buy it at $14.25 only!